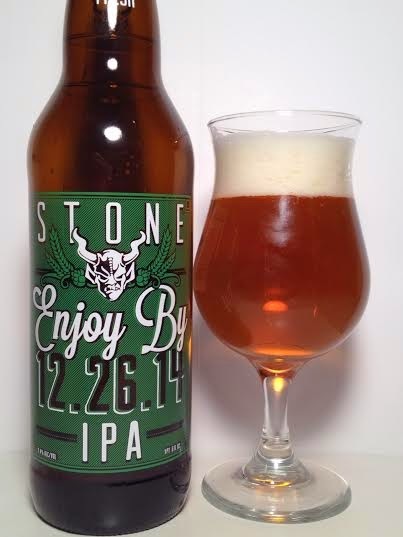 For those unfamiliar with Stone's Enjoy By series, all you need to know is that this is a Double IPA they brew several times a year and release to specific markets that people vote on. Also, it is made to be consumed as soon as humanly possible (hence the enjoy by date in the name). Pours a transparent, glowing orange with very little carbonation and a finger of thin, bright white head. This is one of the cleanest-looking IPA's I have ever seen. The aroma is all dank, earthy hops with tons of West Coast garlic and onion. I can only describe the taste as biting into a raw onion. This kind of flavor is typical (to me anyway) of a lot of West Coast IPA's, but I find it to be a turn-off. Along with that is a significant herbal hop bitterness with tons of bite. I pick up something similar to an artificial lemon candy which is kind of disappointing. The finish has just the faintest hint of grapefruit, but it does little to save you from bulbs of garlic. The mouthfeel, at 9.40%, is rather thick, but not syrupy. Luckily, you can't detect any alcohol presence either. As clean as this looks, it is just as clean on the palate. There's little-to-no carbonation to speak of, but I'm happy to say the off-putting garlic/onion doesn't linger. While dry on the finish, I wouldn't say this is like the Sahara in your mouth. The Enjoy By series isn't my cup of tea. I don't think the hop bitterness is strong enough to combat the unpleasant garlic/onion flavor. The taste is reminiscent of most West Coast IPA's, but just dropped into 4th gear. The positive is that the flavors don't stick around to annoy me for too long. I'm also not a fan of how clean and filtered this beer is. Maybe letting some of the hop oils and resins stick around would have helped create a more unique bitter quality, but alas, such is not the case.